Over the break, the Jackets men’s basketball team began conference play with the toughest three-game stretch of any team this season. In a span of eight days, they faced three of the top ten teams in the country. On Dec. 31, they played the North Carolina Tar Heels in Josh Pastner’s first ACC game. By all accounts, the team faced a huge uphill battle in each game. Early season polls had Tech as the second or third worst team in arguably college’s best basketball conference. However, in a very ugly, hard-fought game, the Jackets prevailed 75-63 in a shocker to start the conference slate. While it was a win, the performance by both teams was less than stellar. While it was a great accomplishment to beat a top ten team in his ACC opener, Pastner still had to prove it was no fluke. Moving into the new year, Tech faced the Duke Blue Devils in Cameron Indoor Stadium. In a game that saw Grayson Allen return from an “indefinite” suspension of one game following a Duke loss to Virginia Tech, the Jackets found themselves outmatched on both ends of the court. When time expired, the Blue Devils had thoroughly stomped the Jackets in a 110-57 rout. The key stat in this game was three-point field goal percentage. Tech finished the game with an abysmal 14.3 percent of shots made beyond the arc, while Duke made a prodigious 51.6 percent. In fact, 48 of Duke’s 110 points were scored from three. Following the tough loss in Durham, the Jackets returned to McCamish to face the surging Louisville Cardinals and their standout Deng Adel. While the game was much closer than the one against the Blue Devils, there was still a very obvious gap between the two teams as Louisville took a convincing 65-50 win. Key performances from Ben Lammers and freshman standout Josh Okogie cut the deficit from double digits to three points midway through the second half, but the talented Cardinals pulled away. The struggles so far this season seem to come on both sides of the court, the offensive side more so than the defensive side. 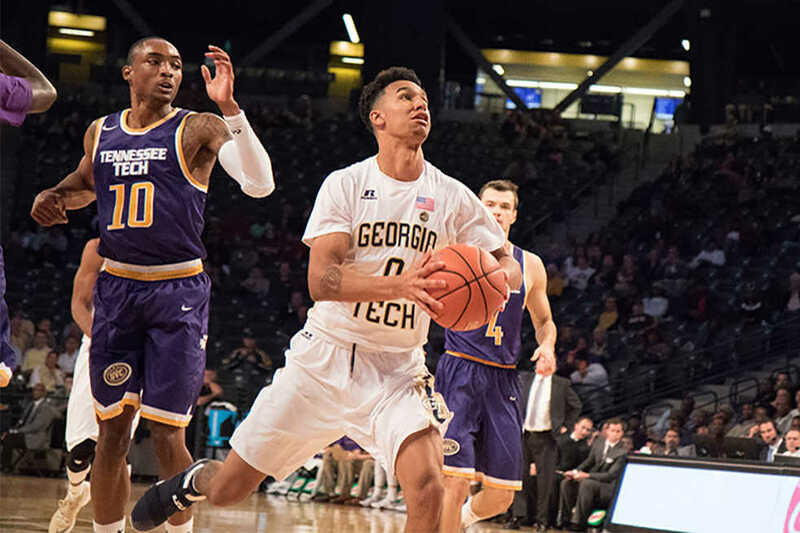 In terms of offense, it seems that if freshman guard Josh Okogie or junior guard Tadric Jackson don’t show up to score, Tech will struggle on offense. That is not to say that Tech does not have offense from other sources — they do. Junior center Ben Lammers has been a shining star of consistency for the Jackets so far this season. He leads the team in points per game, rebounds per game and blocks per game. In addition, he is second on the team in free-throw percentage, which is a humongous feat for a center to achieve. However, despite his consistency, he still needs to work on his offensive rebounding, and he is not one that the team can rely on to score well over 20 points if they need him to. That role falls to Okogie and Jackson who have both answered the call in certain games but failed to do so against some of their tougher opponents. In the Carolina game, Okogie led the team with 26 points, but in the following games against Duke and Louisville he scored 11 and 15 points, respectively. If the Jackets want to win — and win convincingly — he and Jackson should be able to put up at least 35 points together with consistency. As for defensive struggles, it seems that the whole team needs work. Again, Lammers is the shining star. What he lacks in offensive rebounding skill, he makes up for in defensive rebounding. Additionally, he is currently sitting at fourth in the nation in blocks per game with 3.3, only 0.5 blocks per game away from the top spot. However, it seems that the rest of the team is far behind their opponents when it comes to defense. This was painfully obvious in the Duke game as the Blue Devils drained three-pointer after three-pointer over the heads of almost every Tech player. While this start may seem dismal and a sign that Tech will continue to stew at the bottom of the ACC, it must be considered that this is Pastner’s first year as head coach. At the ACC’s annual media days, Pastner’s conference colleagues expressed skepticism about the coach’s likelihood of having success in his first year, according to myAJC.com. That Pastner has already notched a conference win with such an experienced roster is a success in and of itself. The main reason Pastner was brought on to coach was his stellar ability in recruiting players, something Tech basketball has sorely lacked over the past few years. He has already proven his recruiting prowess at Memphis and in the early stages at Tech. A 1-2 record against three national championship contenders puts Pastner right on track. It will be a few years at least before the Jackets can begin to put themselves in the same sentences as their conference rivals. However, the foundation is being laid with each passing game. Perhaps a bit of cautious optimism is warranted for Pastner and his Jackets as they look beyond 2016, developing a program that can contend for conference titles.